I’ve written before about use of modems under Windows 7 & 8. Modems are definitely old-school but still have niche area uses. Now I’m going to be writing about another PC device that has a niche area use – the RS232 serial port – and using this to talk about and illustrate something that isn’t often covered in computer articles for the general public – the issue of chip counterfeiting. RS232 is an old serial port standard that is pretty well documented on it’s Wikipedia article here. At one time, all PC’s shipped with RS232 serial ports. But the serial port requirement for PCs was dropped by Microsoft and Intel in the PC System Design Guide PC-99, available here with the statement: “USB is expected to replace legacy serial” in chapter 13, along with a directive making serial ports optional. To a large extent that did happen with printers and mice and other consumer peripherals. But, what ended up happening with a large variety of industrial devices (like multimeters – a discussion of that is here) is that the manufacturers simply moved the serial port inside of the device and added a USB-to-serial chip, then put a USB port on the device. Buyers would plug the devices into their PC via USB, then load a manufacturer-supplied USB-to-serial driver and then communicate to the device using the same software that they had always used in the past. Unfortunately, however, Microsoft supplied a very buggy generic USB-to-serial driver (USBSER.SYS) with Windows 2000 and later versions of Windows. Bug kb918365 is a typical usbser.sys bug. As late as Windows 10 Microsoft was still fixing bugs in usbser.sys although it has been reported here that it’s _finally_ fixed. As a result, in the first decade 2000-2010, USB-to-Serial port adapter manufacturers had to write their own USB serial stack and drivers. That’s got to be in the running for the understatement of the year in PC hardware! Much of this spotty support was pure profiteering, as the USB-to-Serial port manufacturers had realized that these devices would last for many years. The only way to force obsolescence was to make small modifications in the USB-to-serial port chipset that would allow them to take older device drivers, make insignificant changes to them, then release “new” drivers and “new” chips that were supported on newer Windows versions, but the newer drivers would not be compatible with their older products thus preventing the use of the older products on newer PC gear. In the meantime, the Linux and FreeBSD communities would simply make a few changes to their USB-to-Serial drivers when they released newer operating system versions so you could continue to plug in your 10 year old USB-to-Serial adapter to the latest Linux versions and they would continue to work. Nowhere was this the most blatant than with the company Prolific Technology Inc. Prolific’s flagship USB-to-Serial converter chip is the PL-2303HX chip. The first revision of this chip was the A revision and the chip was widely marked as the PL-2303HXA and PL-2303X chip. Prolific sold many of these chips to manufacturers who made USB to Serial adapter cables, and used these chips in devices from UPSes to GPSes to toys to measuring instruments from Windows 98 onwards. But, Prolific noticed that as the years passed people bought fewer of these chips because after all, just how many USB-to-Serial adapter dongles out there does the technology community need? So in 10/2012 they deliberately modified their Windows 64 bit driver so that it would refuse to work with this chip on Windows 8. Then they released a new PL-2303HXD and PL2303TA chip that is a pin-compatible replacement, and to top it off they announced that because there were “fake PL2303 chips” that was why the older cables they had sold were not working on Windows 8!! (Eventually they did state that they were “discontinuing driver support”) on their website. Needless to say, the Linux and FreeBSD Prolific drivers worked perfectly with the older and newer Prolific chips with no changes needed in the driver. The technology community was further incensed when it was discovered that all you needed to do to get the older PL-2303HXA adapter to work under Windows 8/8.1/10 was to go into Windows 8 Device Installation Settings and change the driver installation preference to “No, let me choose what to do” and “Never install driver software from Windows Update,” which would prevent Windows from pulling down the current PL-2303 driver. Then install the version 3.4.25.218 PL-2303HX driver, (which can be downloaded from many locations on the Internet, such as here, just search for “pl2303_prolific_driverinstaller_v1.5.0”) following the instructions here, or an older driver as here ) and plug the device in. If the device had been plugged in before doing this (which would cause Windows to install the newer driver that did not work) then after installing the new driver, copy over the older version 3.4.25.218 ser2pl64.sys driver on top of the newer ser2pl64.sys on Windows and the adapter would work fine. The process is detailed here. This thread even has an example of how to port the Linux driver to Windows. Today, manufacturers of new PC gear are very stingy with serial ports. The usual procedure is to only add them to some of the high-end business PC gear. Systems aimed for home use simply don’t have them. As a result, because of older PC’s disappearing, the need for USB to Serial converters has grown over the years and more companies have gotten involved in making the converter chips. Besides Phillips which I mentioned earlier, Atmel has produced the ATmega32U6 along with microcode to reprogram that chip to act as a USB to Serial converter, and Future Technology Devices Inc (FTDI) has produced the FT232 USB to UART chips and Texas Instruments has the TUSB3410 chip. TNanjing Ning has the CH340G and Silicon Labs chips the CP210x series, and Cypress has the Semi CY7C65213-28PVXI (this chip costs $6.80 per chip from Mouser Electronics). Increasingly, new technology has brought new uses of these converters as cell phone data transfer cables, accessing and programming network devices, (router “unbricking”) and to configure and program the Arduino prototyping and development boards. This has given rise to USB Converter chips that are clones, and counterfeit. This issue is what the rest of this article focuses on. Legal versions of these chips are made by using original designs and are marked differently than the original chip, but they interface to the rest of the circuitry like the original chip does. That allows them to be compatible with software that is used with the original chip. These chips do not (usually) infringe on the original chip’s intellectual property, but, they do take advantage of effort that was used to write device drivers for the original chip. This is unexpectedly helped by Microsoft’s device driver library since now the cloner does not even have to bother distributing drivers, Windows does it for him. All the cloner has to do is emulate the real chip, use the same USB ID’s and NOT mark the chip with any USB Consortium logos or branding and they will be perfectly legal. The user will be the one responsible for pirating the real chip’s driver, with the assistance of the automatic driver installation software on Windows. Obviously, the original chip manufacturers take a very dim view of these chips, often calling them “Fakes”, “Cheap Chinese knockoffs”, and “cheap clones” in their marketing literature and stating that they are inferior. Sometimes this is true but sometimes even the fakes are just as good as the real ones because of how they are manufactured as I will explain in the following. Counterfeits are chips that are illegally represented as the original chip. They are usually pin compatible with the original chip and marked identically to it. They can be clones, or they can be chips like the ATmega32U6 that are programmed to act the same as the original chip. They are often sold very close to the legitimate chip price. These are the biggest problem in the industry because they contaminate the supply chain – the buyer thinks they are getting the real chip but is being given a fake. The vast majority of true counterfeit silicon chips are made in mainland China. Sometimes counterfeits are made by “black” (illegal) producers but quite often they are simply extra production runs at the same factories that make legitimate chips. When a company like Prolific or FTDI has a Chinese factory run off a batch of 5,000 model FT232’s, the factory will simply run off 10,000 of them and the extra 5,000 chips will be distributed through mainland Chinese organized crime gangs with ties into other Triad societies in the rest of the world. It is difficult for the manufacturer to prosecute because usually the local government officials and police are bribed and cooperate with the criminals and will warn them in advance of an investigation. This kind of activity has been of great concern to China PRC’s central government and periodically they will crack down on organized crime as this activity undermines the central government. Clone chips, as opposed to counterfeit, are also made in China but they are made elsewhere as well. With Clone USB chips, while the chips are legal, their distribution operates in a very grey area because of how the USB branding standard works. Identifying chip counterfeits by looks is not easy. In the following pictures see if you can identify which adapter cable is counterfeit. 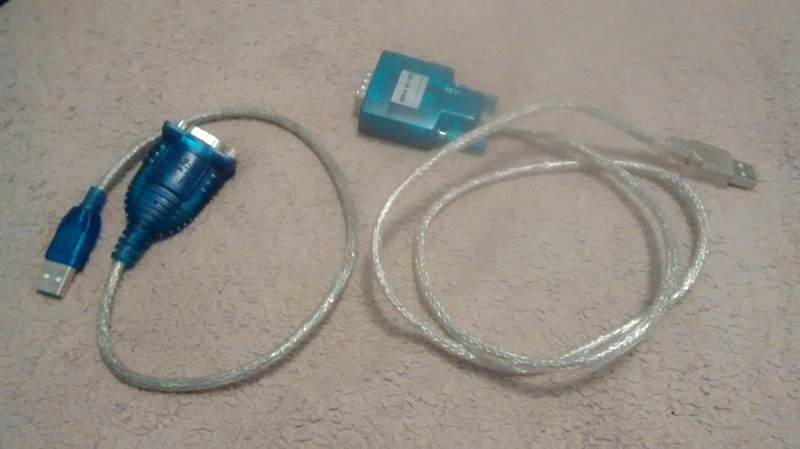 The cable on the left shows the USB Logo, the cable on the right does not. Both cables are similar color – Teal or turquoise – which is the color assigned to serial ports from the PC System Design Guide. Both cables identify as a PL-2303HXA, and both identify as a genuine Prolific chipset and both work with the Prolific driver. The bottom picture is another adapter cable using an FTDI chipset. The governments of the developed countries of the world all take a strong public stance against counterfeit products. Behind the scenes, however, the response is warped by the government of Mainland China, the PRC. The PRC has a long history of not cooperating when the products that are being counterfeited in China are foreign-produced. In retaliation, the governments of the rest of the world tend to ignore counterfeiting of Chinese-produced products. The situation with the CH340G for example, is a travesty. counterfeits of that chip are sold everywhere and openly. What motivated the PRC to adopt this attitude is they wanted to get their citizens and their country into the ranks of developed countries as fast as possible. Ignoring intellectual property protections allowed their industries to rapidly churn out large quantities of inexpensive consumer products. After all if you don’t bother paying licensing fees to the original designer, you save a huge amount of money. But this turned into a trap for them. Because, if someone in China wants to start a home-grown businesses to create original designs, there is no incentive for a product designer to work long and hard to create them since someone will just rip their idea off – and their government will not prosecute. As a result – China’s high tech industry is stunted and will remain so – and other countries quietly take an approach of containment towards the counterfeiting there. In the USB-to-serial converter category, probably the most commonly counterfeited chips out there are the Prolific and the FTDI chips. Both of those companies have taken several non-technological approaches to fight counterfeits. The first is direct sales – for businesses that are going to be buying these chips in bulk, FTDI maintains a list of sales offices here. Prolific also sells direct but only out of their main office. The second is certifying “Authorized distributors”. Prolific and FTDI both list their distributors on their website. That last is their approach to end users. With Prolific, they try to get end users to buy finished products from brand name VARs and OEMs. For example, if you buy a USB-to-Serial converter cable from Dell that has a Prolific chip in it, it should be genuine. 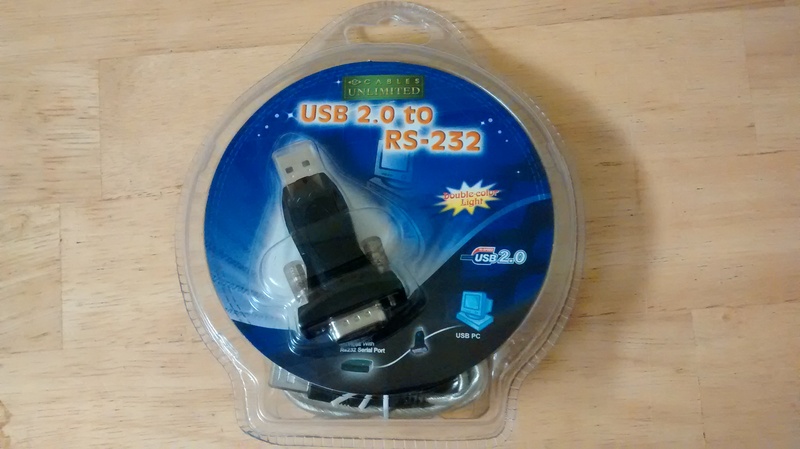 However if you buy a USB-to-Serial converter cable in a “white box” from a corner computer store with no brand name on it, it’s likely counterfeit. Prolific sells directly to VARs and OEMs through their prolificusa.com distributor. FTDI, by contrast, does sell “engineering evaluations” of USB cables from it’s website, but they list most of the common distributors like Digi-Key, Mouser, and Allied Electronics as partners on their website. Prolific’s chip isn’t in the major electronics parts distributors inventory but it is carried by some of the smaller ones like Quest Components. The biggest holes in the supply chain today, where counterfeit chips are most commonly inserted into the market, are the direct-to-retail operators who are located online, on Ebay and to a lesser extent, Amazon. For example a recent search on Ebay shows a very common “blue-translucent” USB to-Serial adapter cable, purporting to have a Prolific chip in it, available directly from China for $4.99. A similar cable that’s black with leads on it purporting to be FDDI was available for around $3. Just looking for USB cables that list the part number only – PL2303HX – found many more listings in the $1.50 range. And these are just the USB-to-RS232 serial port cables. There are many more USB-to-Serial cables that are intended for plugging directly into router motherboards and use leads as the output, instead of a DB9 connector, that sell for even less. Most technology companies choose non-technical, legal means of attacking counterfeiters. But two of the USB-to-serial chip producers tried something else. The first was Prolific with their PL 2303 HXA chip. Prolific inserted a probe for a genuine chip sometime after the 3.2.0.0 driver version into their Windows driver, that would cause the driver to refuse to load, and display an error message, or BSOD if it detected a counterfeit chip. If you have a device that uses one of these chips that you don’t want to throw away, the older driver is linked to here There is also a discussion about this here Prolific also came out with a new chip, the version D, which is incompatible with the older drivers, and they wrote a new driver which refuses to work with the older version A chips. Prolific made sure that this newer driver version was distributed through Windows Updates so many people did find that devices they had which were working previously, suddenly stopped working, thus causing them to go back to the device manufacturer and complains. Counterfeiters, predictably, reacted to this. After the 3.2.0.0 driver was released the counterfeiters duplicated the USB ID string and other workings of the Prolific chip more exactly, so that the “genuine” cable check was defeated. Then, after the 2012 driver was released that refused to run under Windows 8 with the PL-2303HXA chip, they changed their fakes to be recognized as the real “D” chip. So, ultimately these technological changes did not work to prevent sales of the counterfeit PL-2303HXA & HXD chips. Instead, they merely served to make things difficult for consumers who already had devices that used the counterfeit and older chips, many of these devices wern’t even USB adapter cables. However, what Prolific did pales in comparison in the counterfeit war as compared to what FTDI did. In summary, the electronics industry is replete with counterfeiters, who counterfeit everything from entire devices down to parts used in other devices. But, setting aside the legalities, whether or not counterfeiting is completely bad is subject to debate. On one hand, counterfeiting drains money from the companies who actually spend money on R&D to create new products. Besides harming those companies that reduces money for R&D and slows the advancement of technology. Counterfeits that are injected into legitimate supply chains also generate a large amount of money that is used to fund a lot of criminal activity up to and including terrorism. Even if a counterfeiter does not involve itself in supply chain contamination, criminals can purchase low-cost counterfeits, substitute them in the supply chain, and pocket the difference. However, on the other hand, it can be argued that the end user customers buying ultra cheap parts likely know they are counterfeits, and couldn’t afford to buy the expensive parts, thus do not represent a revenue loss. Also, it’s clear that some designs that are counterfeited, are older designs that have long ago paid back their original R&D investments along with a fair profit, and are now just being “milked” Counterfeiting serves as a competitive check on that activity thus the “milking” companies cannot raise their prices to obscene levels. And, much of this is moot anyway since until the government of the PRC gets serious about counterfeiting, the world will be flooded with counterfeit products. In the last analysis, the consumers and manufacturers are the ones who have control here. Consumers can choose to buy cheap, and manufacturers can use China for their electronics product production, (thus handing their designs over to the center of the counterfeiting snakepit in the world) and both these groups penny-pinching will harm attempts to bring out new products. Or consumers can try to buy original designs and the additional cost will go towards funding new R&D efforts that will accelerate the speed of introduction of new, revolutionary products. This server has received 230840 hits from both ipv4 and ipv6.